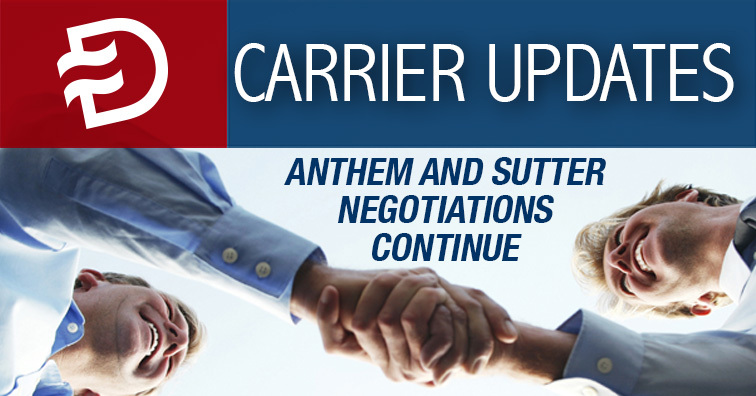 Although Anthem Blue Cross’s agreement for commercial business with Sutter Health had extended only through December 31, 2018, they are still currently involved in negotiations on a new contract. The current agreement also allows Sutter providers to remain available to members while negotiations continue past this date. If negotiations aren’t successful within the next two months, Anthem will be transitioning HMO consumers currently assigned to Sutter doctors to other in-network primary care physicians, effective April 1, 2019. State regulations require Anthem to notify consumers 60 days in advance of any changes made to their assigned physician medical/group. Letters have also been sent to these consumers. Anthem encourages agents with questions to contact their Broker Support Sales Team. The Department of Managed Health Care (DMHC) has required Blue Shield to pause the marketing of both their Bronze PPO 4000/70 OffEx and Bronze PPO 6000/65 OffEx Plans. The department is requiring that modifications be made and the new benefit changes approved before the plans are reinstated. New group submissions submitted prior to February 8, 2019 will not be affected. Applications received after this date that include these plans will be pended for the subscriber(s) to select another available plan. Blue Shield will send another market announcement on benefit changes and availability for these plans once they are again approved. Click here for more information. To make it easier for brokers to sell, they are relaxing some of their small group underwriting rules through June 15th, 2019. See below for their relaxed split carrier participation rules. As long as 60% of the eligible employees enroll in a plan offered by the employer, Oscar will only require three eligible employees to enroll with them. Oscar can be written alongside any other carrier, and any plan type – HMO, PPO, or EPO. Groups with CaliforniaChoice are not eligible for this promotion.